Peace must remain in Southern Sudan for Water for Sudan to continue drilling water wells that save lives. Peace is inextricably linked to Southern Sudan’s referendum for independence, to be held on January 9, 2011, now less than six months away. Six months after that Southern Sudan could be the planet’s newest nation. Around the world increasing attention is being paid to the tenuousness of successful implementation of the referendum, given the scant preparation to date, the critical issues remaining to be resolved, and the lack of time. The United States, Britain and Norway issued a joint statement that they are "deeply concerned" about Sudan. Read the full article. US Special Envoy to Sudan Scott Gration, speaking at the Center for Strategic and International Studies, said, “What we do in the next three to six months, I believe, will determine the course of this region for the next three to six years, and so it's very important that we get this right." Read the full article. Even China, often silent on issues in Sudan where it has significant oil operations, is calling for action towards maintaining peace. "We hope relevant sides will listen to the African Union, the League of Arab States and countries concerned, and play a constructive role in maintaining peace and stability in Sudan and the region," said Foreign Ministry spokesman Qin Gang. Read the full article. Expression of concern and words of support will not ensure peace. Nor will they ward off resumption of full scale civil war, putting millions of lives at risk. Today, twenty-six activist groups jointly released a report detailing specific actions the US, the European Union, the African Union, and other Guarantors of the 2005 Comprehensive Peace Agreement (CPA) can take to facilitate successful completion of the peace process mandated in the CPA. Read the full article. Some progress is being made. Leaders from Northern and Southern Sudan began formal negotiations on July 10th on issues including oil revenues, borders, and citizenship. The leaders said they would consider forming a confederation or a common market if southerners choose to declare independence in the forthcoming referendum. In a detailed public statement on what Sudan might look like after the vote, they told reporters they were considering four options suggested by an African Union panel led by former South African president Thabo Mbeki. In one option "we considered the possibility of the creation of two independent countries which negotiate a framework of cooperation which extends to the establishment of shared governance institutions in a confederal arrangement," said Mbeki, who spoke at the launch of negotiations in Khartoum. The other options, he said, were for two separate countries with shared "soft borders that permit freedom of movement for both people and goods; total separation with citizens needing visas to cross the border; and continued north-south unity, if southerners choose that option in the referendum." Read the full article. This post offers a selection of links to articles covering the primary issues regarding the US and international community’s approaches to Sudan policy. The countdown to the Comprehensive Peace Agreement's mandated January 2011 referendum on whether Southern Sudan will separate from northern Sudan and become the world's newest country is accelerating. The many issues facing the country potentially about to "divorce" are well documented. There is rising concern about lack of preparation by both the north and the south. How much linkage should the United States, the United Nations, and the African Union attach between Darfur and the referendum on Southern Sudan's independence? How can the international community best help Sudan avert renewed war? What level of participation and oversight will be required before and after the referendum? “We often find ourselves looking at humanitarian crises and wondering what we can do to help. This is a moment where we can contribute to stopping one before it happens. We believe the challenge in Sudan … requires the president's direct and imaginative engagement. Failure in the form of renewed war and hundreds of thousands more deaths — conservatively — is not an option." "Special Envoy to Sudan Scott Gration recently commented that the U.S. does not have any leverage in Sudan, a view that appears to be shared by others in the Obama administration. According to John Prendergast of the Enough Project, that view is wrong. He is working on a report that will spell out eight areas in which the U.S. already has leverage it is not utilizing, and proposes five more ways to increase that leverage." "An integrated approach to stability in Sudan, linking peace in Darfur to preparations for the January referendum on the future of Southern Sudan, was presented to the Security Council by officials of the United Nations and the African Union this morning." "UK Ambassador Lyall Grant said 'With over 30,000 peacekeepers on the ground throughout the country there is no greater challenge facing the Security Council over the next 12 months than supporting the parties in securing peace and prosperity for the people of Sudan.' "
"U.N. Special Representative Halie Menkerios said that the National Congress Party (NCP) and the Sudan People's Liberation Movement (SPLM) — both signatories to the CPA — have separately informed UNMIS that they 'desire UN engagement at a much greater level' than in April to help ensure a fair vote, but have yet to provide Secretary-General Ban Ki-moon with detailed requests." “What happens in southern Sudan over the next nine months will shape the future of Africa’s largest country and the continent itself. International diplomacy is vital to help smooth the way and ensure large-scale conflict does not erupt. Sudan needs urgent international support from the UN Security Council to ensure the referendum goes peacefully." "Secretary Clinton reaffirmed the U.S. commitment to the full implementation of the CPA. The Secretary also emphasized the need for immediate and serious discussions about post-CPA arrangements on resource management, security, citizenship and other issues. The Secretary welcomed AU/UN efforts. She underscored the urgency for the UN and the AU to move as rapidly as possible to support mechanisms for conducting the January referenda in Abyei and in Southern Sudan. The Secretary also expressed U.S. support for the AU/UN-led Darfur mediation in Doha and noted that despite the progress in negotiations in Doha, the conditions on the ground remain deplorable. Finally, the Secretary called on all parties to intensify their efforts to find a solution to the problems in the region." "National Security Advisor General James L. Jones welcomed Thabo Mbeki, the Chairman of the African Union (AU) High Level Implementation Panel for Sudan and former South African President, Haile Menkerios, United Nations Special Representative of the Secretary General for Sudan to the White House to discuss Sudan. During the meeting, President Obama stopped by to underscore the United States' commitment to working closely with the AU and the UN on the timely implementation of Sudan's Comprehensive Peace Agreement and to a just and lasting peace in Darfur."
. Play a more direct role in revitalizing Darfur’s peace process, ensuring access for humanitarian assistance and promoting accountability." "Sudan may ask the United Nations to run a referendum on the future of a politically sensitive border region after northern and southern leaders failed to appoint organizers. The residents of Abyei are less than seven months away from a vote on whether their border territory, close to key oilfields, should be part of north or south Sudan." "So far, the Obama administration has been shockingly tolerant of backsliding on human rights issues and disrespect for democratic values, seemingly favoring policies that maintain the status quo rather than push for bold reforms. U.S. influence could go far at this critical moment. Nothing is gained in the long run by turning a blind-eye as regimes further consolidate their power through repressive means." Despite such enormous challenges, the Southern Sudanese are people with a strong will and desire to improve themselves. They are proud, motivated people — survivors who retain their dignity despite losing 2 million people in wars, and living in one of the least developed, most challenging places on Earth. The Southern Sudanese need more from us than water. They need our political will and support. A voter in a Sudanese polling station (c) UNAMID/Albert Gonzalez FarranIn January 2011 the Southern Sudanese will vote to either remain part of Sudan or separate into a new country, per the 2005 Comprehensive Peace Agreement. This referendum needs massive international support to succeed and keep the north and south from renewing civil war. There's much work to be done — negotiations over oil, borders, finances, and defense to name a few. And they are woefully behind schedule and ill-prepared for the challenges. 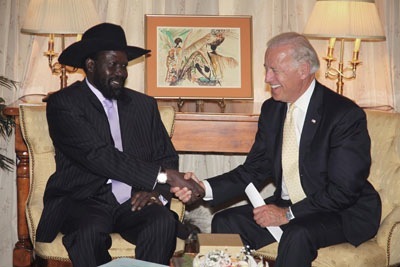 The U.S. needs to play a much more active role to ensure Southern Sudan remains at peace whatever the outcome of the referendum. Experts on U.S. policy on Sudan say one of the best ways to help is to write a letter — an actual, personalized letter — insisting that your representative or senator do something to make the United States take the lead in this critical period. The U.S. should implement a Sudan policy that develops real carrots and sticks, and deploys experienced diplomats to help lead negotiations to prevent a renewed North/South war and end the war in Darfur. Click here to find out where to write a letter to your senator or representative. Please write today. Click here to read more about the issues in an article by Alan Boswell for IRIN humanitarian news and analysis, a project of the UN Office for the Coordination of Humanitarian Affairs. Alan Boswell is an American freelance journalist currently based in Juba, Southern Sudan. He writes for Bloomberg, TIME, IRIN, and others.